Springtime seems to be a productive time for musicians. I guess they must hibernate over the winter nurturing all their creative talents ready for an influx of new album releases in the spring, just in time for the summer festival season? 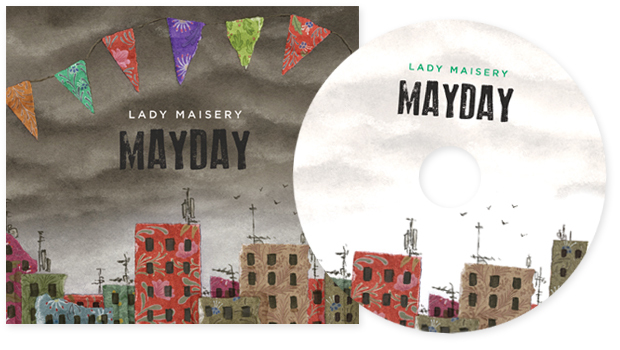 This spring we’ve had the pleasure of working with Lady Maisery on their latest release. The artwork is all done, checked, double checked and should now be getting itself ready for pressing… here’s a sneaky preview of the beautiful cover! We first worked with the Radio 2 Folk Award nominated trio on their debut album ‘Weave and Spin’ back in 2011 so we’re pleased that they chose to work with us again on their latest release ‘Mayday’. The album is a collection of stories about different human struggles. Many are warnings, often lamenting personal tragedies, whilst others reveal the determination of the human spirit and the persistence of life. The band are having a launch event for the album where you will be able to buy pre-release copies at special prices… This will be on the 15th May at St Pancras Old Church, London. Get yourself down there! The artwork reflects the content of the album, and with it’s weird mix of danger and celebration it has quite a unique look! It’s been a special treat to work with the illustrations of Joel Stewart on this project.